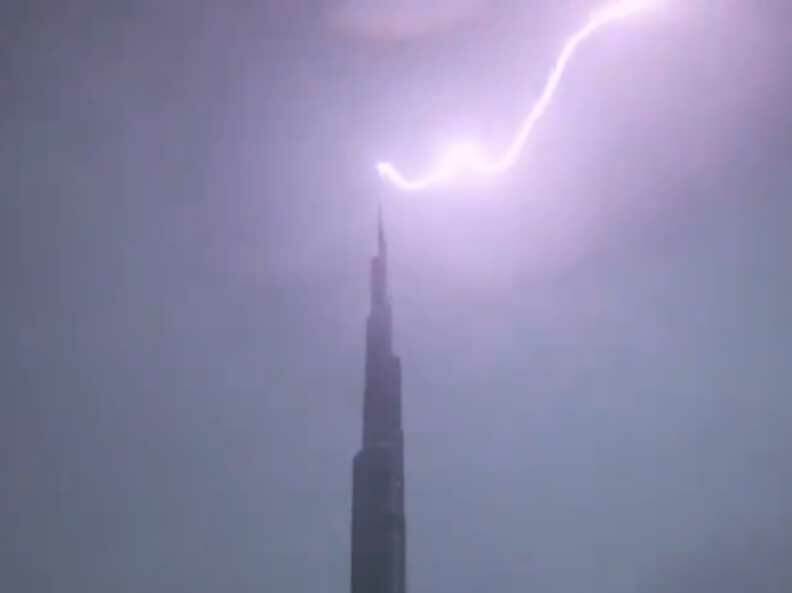 On Saturday night, a stunning video footage captured the milliseconds when up to a billion volts of electricity discharged by the lightning struck the world's tallest building — in slow-motion. Shaikh Hamdan Bin Mohammad Bin Rashid Al Maktoum, Crown Prince of Dubai, shared a tweet showing the moment the spire of the 828 metre-tall Burj Khalifa in Dubai was hit by lightning during the early-evening storm, leaving residents mesmerised by nature's enchanting show. Lightning is an electrical discharge caused by imbalances between storm clouds and the ground, or within the clouds themselves. Most lightning occurs within the clouds. During a storm, colliding particles of rain, ice, or snow inside storm clouds increase the imbalance between storm clouds and the ground, and often negatively charge the lower reaches of storm clouds. When lightning strikes, objects on the ground — steeples, trees, and the Earth itself, become positively charged — creating an imbalance that nature seeks to remedy by passing current between the two charges. In Dubai's case, the spire of the super-tall Burj Khalifa, currently the world's tallest man-made structure at 828 metres, became the city's lightning rod — the tallest structure that helped divert the lightning harmlessly into the ground. Tarek Ghobar, Dubai resident, shared on Twitter a clip taken from his balcony showing the moment lightning struck Burj Khalifa's steeple on Saturday. Cloud-to-ground lightning bolts are a common phenomenon—about 100 strike Earth's surface every single second—yet their power is extraordinary. Each bolt can contain up to one billion volts of electricity. Lightning is extremely hot — a flash can heat the air around it to temperatures five times hotter than the sun’s surface, according to the National Geographic magazine.